Your Source For Ski Resort Deals. Ski vacation packages to Idaho. Take advantage of our deals, discounts, the best planning advice, or create your own ski / snowboard package. Being home to the first chairlift in the world, Sun Valley Resort has become the oldest existing and operating ski resort in the U.S. where skiers of all ages can take advantage of excellent skiing areas. 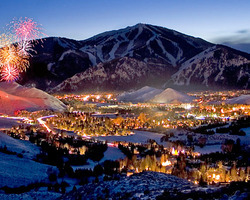 The resort also holds two of the best skiing mountains of the state namely: the Dollar Mountain and the Baldy Mountain. Up to date, there are about 18 lifts that provides uphill services and can carry 28,180 people an hour. This all-time favorite classic ski destination has been the training ground of professional athletes competing for the Olympics as well as home to famous Hollywood cliques.